The Best Houston blogs from thousands of top Houston blogs in our index using search and social metrics. Data will be refreshed once a week. Houston, TX About Blog Planning your vacation to Houston? View information on hotels, events, restaurants and things to do in Houston, Texas and plan your trip today! Facebook fans 429,257. Twitter followers 82,532. Houston, TX About Blog CultureMap Houston is your daily source for local lifestyle news, including where to eat and what to do. Facebook fans 66,061. Twitter followers 188,843. Houston, Texas About Blog Houstonia is a news, entertainment and information source as smart, exciting and vital as the people who call Houston home. Facebook fans 56,853. Twitter followers 34,889. Facebook fans 1,171,383. Twitter followers 530,772. Houston, TX About Blog The Houston Restaurant, Bar, and Nightlife Blog. Food news and dining guides for Houston. Facebook fans 22,690. Twitter followers 33,086. Houston, TX About Blog Diehard and loyal Houston Rockets fans, ClutchFans has been giving the honest dish since '96. Facebook fans 12,196. Twitter followers 48,089. Houston About Blog Houston On The Cheap - daily deals, cheap eats, free weekend fun. Discover free weekend fun, outdoor movies, cheap eats kids eat free in Houston! Facebook fans 81,571. Twitter followers 8,908. Houston, TX About Blog Explore the far reaches of outer space, roam with the dinosaurs, wander through Africa's Serengeti, and marvel at the world's rarest and most beautiful minerals. Discover all this and much more at the Houston Museum of Natural Science, one of the nation's most heavily attended museums. Facebook fans 121,109. Twitter followers 18,454. Houston, TX About Blog The Houston Independent School District exists to strengthen the social and economic foundation of Houston by assuring its youth the highest-quality elementary and secondary education available anywhere. Facebook fans 35,860. Twitter followers 130,633. Houston About Blog Swamplot covers real estate, home design and renovation, architecture, and the landscape of Houston, Texas. Facebook fans 10,409. Twitter followers 7,552. Houston, TX About Blog Your best source for quality Houston Texans news, rumors, analysis, stats and scores from the fan perspective. Facebook fans 13,417. Twitter followers 7,050. Facebook fans 1,171,398. Twitter followers 530,772. Houston, TX About Blog We are passionate about our community and the moms who live here, and our goal is to make this big city that we all live in feel just a little bit smaller. Facebook fans 27,579. Twitter followers 2,895. 14. Big Kid Small City — Things to do in Houston! Houston About Blog BigKidSmallCity is an upbeat blog dedicated to making our big city feel small. We are passionate about exploring Houston, learning more about the people and organizations, contributing to the city and providing resources for parents of young children. Facebook fans 26,122. Twitter followers 4,778. San Francisco, CA About Blog Home of the MLB Houston Astros. Houston, Texas, USA About Blog As Houston's Dining Magazine we guide visitors and resident foodies of Houston through the city's constantly evolving restaurant, bar and culinary scene. Facebook fans 9,314. Twitter followers 7,185. San Francisco, CA About Blog Up to date information, videos, photos, links of Houston Rockets. Facebook fans 1,171,384. Twitter followers 530,772. Houston About Blog Commercial real estate insights, trends and news from JLL's Houston team. Facebook fans n/a. Twitter followers 499. Bayou City About Blog The ultimate home for Houston sports. Covering the Houston Texans, Houston Rockets, Hoston Astros, and more! Facebook fans 1,453. Twitter followers 4,839. Houston About Blog Read more for the latest Port Houston news and stories! Facebook fans 5,123. Twitter followers 5,932. Houston, TX About Blog In-depth coverage of Houston's food, drinks, people who make them and the places that serve them. Facebook fans 3,707. Twitter followers 1,147. Houston, TX About Blog We are proud Houstonians looking to put our city on the map and have it recognized by people all over the world. Within our blog, you’ll find our honest opinions about a yoga class we tried, a brunch drinking game, our 24 hours in cities all over the world, and, most importantly, all the things we love about Houston. We know that the city is full of never-ending adventures and we’re blogging to share out experience and expertise about Houston and inspire readers o are new to the city. Facebook fans 2,570. Twitter followers 2,371. Houston About Blog Houston, Texas is filled with LGBT-friendly nightlife, dining, hotels and shopping. Learn about Houston's LGBT community and plan your vacation. Facebook fans 39,918. Twitter followers 1,061. Houston About Blog Local Houston Magazine is the city guide for Houston. In a diverse, ever-growing city, Local Houston keeps readers up to date on all things Houston. Facebook fans 12,899. Twitter followers 30,697. Houston, TX About Blog The Loken Group, a team of specialists out of the Keller Williams Realty Signature office, serves real estate buyers, sellers and investors in all 9 counties in the Greater Houston Area. Facebook fans 4,097. Twitter followers 506. Houston, TX About Blog "ItsAHoustonThing" grew from the creative minds of three Houston locals who envisioned a local media source and lifestyle brand devoted to the unique culture of Houston. Facebook fans 86,457. Twitter followers 982. Houston About Blog Houston Agent magazine is Houston’s leading source of local news and information for the well-informed residential real estate professional.Through its robust website and newsletters, It provides real estate professionals with the breaking news and in-depth features that they need to build their business and stay connected to the community. Facebook fans 1,105. Twitter followers 1,728. Houston, TX About Blog City Insight is a Houston real estate firm that focuses more on Houston and its culture. We provide phenomenal apartment locating services. Get to know us. Facebook fans 94. Twitter followers 16. 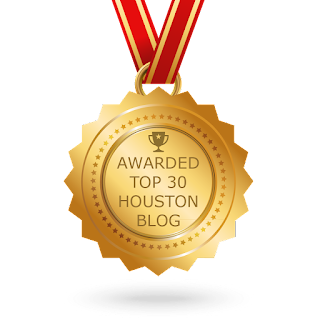 CONGRATULATIONS to every blogger that has made this Top Houston Blogs list! This is the most comprehensive list of best Houston blogs on the internet and I’m honoured to have you as part of this! I personally give you a high-five and want to thank you for your contribution to this world.